Picking Apart Le Grenier 1034 Spruce St. 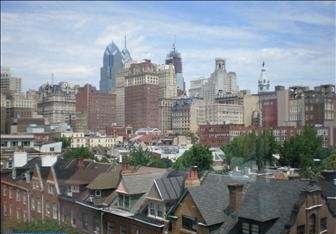 These Philadelphia condos at 11th and Spruce Streets offer sleek, contemporary, condominium units in a very desirable Washington Square West location – a five minute walk from Center City shopping, dining & nightlife and a short walk to Jefferson Medical University Hospital! 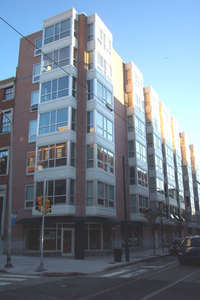 1034 Spruce Street is an elevator building, with a modern lobby and attractive common hallways throughout. Bicycle storage is offered in the basement. Most units offer wood floors and large bright windows. Boutique in nature, Le Grenier houses a limited number of flats on each floor and every condo unit in the building has a buffer between units- be it a staircase or elevator. 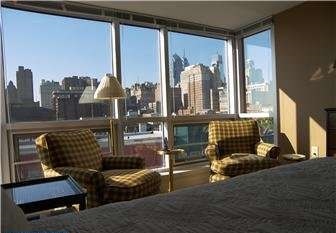 A wonderful addition to the Philadelphia real estate set, the Washington Square West condos show very well, have great light and the upper level units have fantastic Philadelphia skyline views! Le Grenier condominiums (aka 301 S. 11th Street) is located on the southeast corner of 11th and Spruce Streets, this project arose from the ashes of a former kinda’ icky apartment building that caught on fire and burned back around 2002 or so. Le Grenier has a maximum of three units per floor…and no two units on any floor share a dividing wall- between units one and two is the elevator shaft and between the other two condos is a stairwell (so perhaps no noise from the neighbors). We have sold four units in this 19 unit building and I think the lack of alternatives in terms of proximity to Jefferson Medical, as well as a great central location in town is really a strong “one-two” punch. Rental parking is across the street and you can ALWAYS catch a cab outside your front door at this address. I think this modern looking little mid-rise condo building is really kinda’ hip and modern and there are not many similar buildings around town like it. 1034 Spruce Street. condos max out at just over 1100 sq ft and are popular with the Jefferson Medical set due to proximity. Floor to ceiling windows provide superior light and views and the condos at LeGrenier are finished in a modern hip way with nice baths and open kitchens. And the higher floors have a killer view of the skyline. 1034 Spruce offers no amenities beyond an elevator and some bicycle storage in the basement. The lack of shared amenities equates to condo fees being reasonable. Each unit has its own HVAC system and hot water tank. The building has handicapped modifications in the lobby and a ramp. I think 1034 Spruce Street has a built-in resale market being so close to the neighboring hospitals. I would look for values to hold steady over the next decade or so and I think the units at Le Grenier are a smart buy and we have named the building one of the Ten Best in Center City 2009 . Rarely available..buy ’em if you can find ’em!